What many Americans have feared is now reality. An Ebola infected individual has travelled on a commercial airliner and a busy U.S. metropolis exposing hundreds of individuals to this deadly disease—right? Although true in part, there’s more to the story. Ebola is not yet considered an airborne illness. Although it is aggressive and infectious, it’s not very durable outside of the body. Some studies have shown that under ideal circumstances (ideal for the virus) it can survive on a doorknob or countertop for up to six days. But since Ebola is killed by heat, oxygen, and UV light, under normal circumstances such as an airplane environment it can only survive for a few hours. Air travel from the infected regions in Africa requires every passenger to have a body temp check before boarding. If you have a fever, you don’t board. Additionally, simple disinfectants such as Lysol and Clorox kill the virus, as does washing in hot water. One of the major concerns remains that the virus could mutate to become easily transmitted by airborne means. Currently studies have indicated that airborne dissemination requires close proximity with someone with active symptoms. This has been shown with only one study in Canada. All other studies still note that it is not yet airborne. 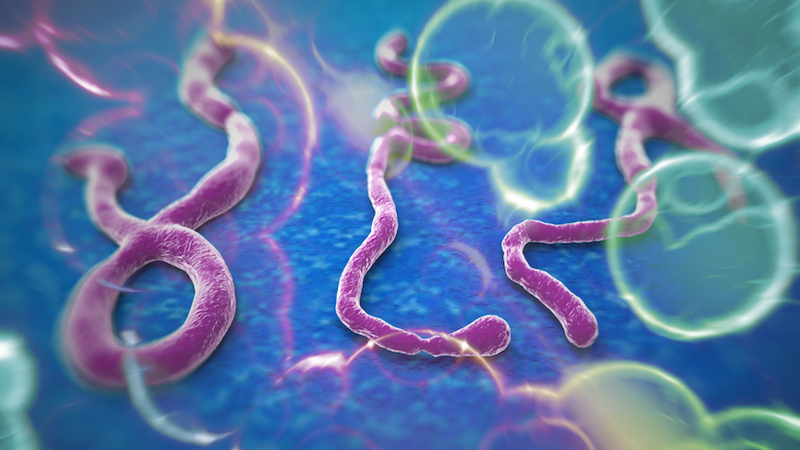 Ebola is an RNA virus, which means it mutates several genes with each replication. At any point, the airborne mutation could occur. With every infected individual, this becomes more and more likely. Since the incubation period (the time from exposure to showing symptoms of active disease) varies from 8-21 days, it is possible for a traveler to begin to exhibit symptoms while in travel. Such an individual should contact airline personnel immediately so they may be removed to the most isolated part of the airplane, and in order to have the proper receiving authorities and equipment at the airport upon arrival. Currently the medication ZMapp, which was given to Dr. Kent Brantly and Nancy Writebol at Emory in Atlanta is no longer available. The doses have been used up entirely when the company producing the medication donated all it had to authorities in Liberia. Although the company is currently working on manufacturing more doses, it takes quite some time for it to develop the medication. An experimental drug called TKM-Ebola will be given for new cases in the U.S. It is not known if this medication works. Supplies are also very limited. Prevention is the key, and the most effective way to protect oneself during air travel is to wash hands often, and disinfect frequently. Sanitary hand wipes can be used on doorknobs and handles when on an airplane. They won’t cause any harm and will easily kill Ebola. Avoid contact with anyone with Ebola symptoms like the ones noted above who has travelled to West Africa within the past 21 days, or who has been seen in the hospital in Dallas in the past week. Unless direct exposure has occurred, there is little or no risk of contracting Ebola. Next: IS GOD ASKING YOU?